2017 hasn’t really been the Year of LaBeouf, has it now? A few months after being arrested for assaulting someone at his anti-Trump art installation, Shia LaBeouf is on the wrong side of the law once again. TMZ reports that the actor was arrested in Georgia early Saturday morning for “being wasted and losing control of himself” and was taken into custody and booked for disorderly conduct, obstruction, and public drunkenness. 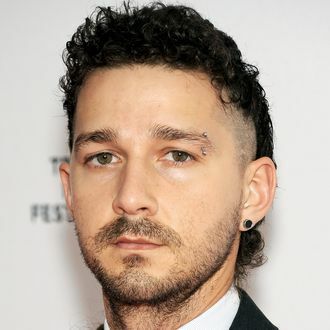 According to a police report, the incident stemmed from a bystander refusing to give LaBeouf a cigarette when approached on the street at around 4 a.m. When his nicotine request was denied, LaBeouf “became disorderly, using profanities and vulgar language in front of the women and child present.” An “aggressive” LaBeouf was then chased by a police officer from the scene, opting to run to a “nearby hotel” in the hopes of an escape. He was promptly arrested in the lobby. LaBeouf has previously been arrested for jaywalking in Texas (really!) and causing a scene during a Broadway performance of Cabaret (also really!). He should be out of custody by the end of the day — his bond is $7,000 — and he would probably like you to watch the trailer for his new tennis movie instead of dwelling on this. This post has been updated throughout with new information.